Affordable and traditional. 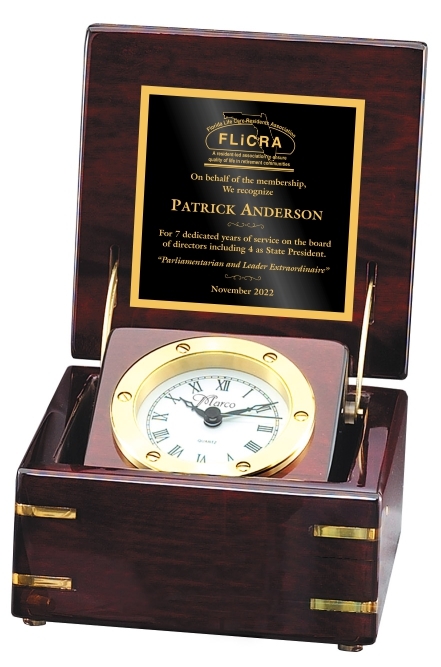 This clock meets those needs with it's Rich Rosewood finish and Gold accents. They do a great job and the customer service is excellent! My wife and I have used Awards 4U for over 10 years for our company nametags. We own Answer One Motors and previously owned Answer One Mortgage here in Tallahassee. Justin Varn really went above and beyond on my last order. We work 6 days a week and had a difficult time getting over to the store to pick up a few nametags for new employees. Justin actually lives near us and he actually took the time to collect my order and drop it at my home so that I wouldn't have to go pick it up. The entire Varn family is truly dedicated to making sure their customers are happy. This example really demonstrates how willing they are to go the extra mile. I appreciate all that they do and the top notch service that they provide. You can't go wrong with Awards 4U !!! I would like to send Mr. Sam and Tony a heartfelt THANK YOU! Tony you went above and beyond to get my order to me on your day off so that our youth football team end of the season celebration could be complete. ???? Again, On behalf of the league coaches we appreciate all of your efforts! Have a wonderful holiday weekend!